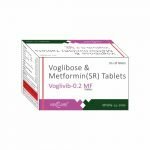 Metformin is a biguanide antihyperglycemic agent used for treating non-insulin-dependent diabetes mellitus (NIDDM). It improves glycemic control by decreasing hepatic glucose production, decreasing glucose absorption and increasing insulin-mediated glucose uptake. Metformin may induce weight loss and is the drug of choice for obese NIDDM patients. Use of metformin is associated with modest weight loss. When used alone, metformin does not cause hypoglycemia; however, it may potentiate the hypoglycemic effects of sulfonylureas and insulin. Its main side effects are dyspepsia, nausea and diarrhea. Dose titration and/or use of smaller divided doses may decrease side effects. Metformin should be avoided in those with severely compromised renal function (creatinine clearance < 30 ml/min), acute/decompensated heart failure, severe liver disease and for 48 hours after the use of iodinated contrast dyes due to the risk of lactic acidosis. Lower doses should be used in the elderly and those with decreased renal function. Metformin decreases fasting plasma glucose, postprandial blood glucose and glycosolated hemoglobin (HbA1c) levels, which are reflective of the last 8-10 weeks of glucose control. Metformin may also have a positive effect on lipid levels. In 2012, a combination tablet of linagliptin plus metformin hydrochloride was marketed under the name Jentadueto for use in patients when treatment with both linagliptin and metformin is appropriate. Acute oral toxicity (LD50): 350 mg/kg [Rabbit]. It would be expected that adverse reactions of a more intense character including epigastric discomfort, nausea, and vomiting followed by diarrhea, drowsiness, weakness, dizziness, malaise and headache might be seen. For the treatment of diabetes. It is specifically used for lowering post-prandial blood glucose levels thereby reducing the risk of macrovascular complications. For use as an adjunct to diet and exercise in adult patients (18 years and older) with NIDDM. May also be used for the management of metabolic and reproductive abnormalities associated with polycystic ovary syndrome (PCOS). Jentadueto is for the treatment of patients when both linagliptin and metformin is appropriate.